Several car magazines recently have hinted that Lincoln may be considering a rear wheel drive platform using the new 2015 Mustang IRS and updated S197 chassis. Do they have inside information, or is this just speculation? Given Lincoln’s lackluster lineup, and the tremendous success of Cadillac with the CTS and ATS, we would find it hard to believe that Lincoln isn’t looking more closely at this idea. Especially given the low-investment (using a stretched Mustang chassis) and the superb line of current engines – probably topped by the 3.5 liter EcoBoost V-6. 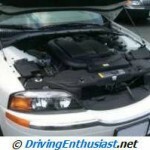 These engines match and exceed anything that Cadillac can offer in the ATS, as well as BMW with the current 3-series. We do find this ironic since Lincoln had such a product for several years, but didn’t know how to sell it and didn’t invest any significant money in updating it. The Lincoln LS was built on a state-of-the-art platform internally dubbed “DEW98” which was also shared with the Jaguar S-Type and the Thunderbird (and was originally intended to be the basis for an all-new Mustang in the 2002 timeframe, until the bean counters decided it was too expensive). It featured a heavily aluminum-intensive suspension and crossmembers with double-A-arm coilovers at all four corners and would still be state-of-the-art today (Jaguar continues to use a slightly updated version of it). And it would also be an even competitor against the Nissan/Infiniti “FM” platform, another state-of-the-art architecture used for the 370Z, G, M, FX, and EX lines. We’ve put in many thousands of miles in various iterations of the LS over the years and we’ve found it to be a very competent and inspiring drive. There are still enthusiast groups dedicated to the car, with one enthusiast even offering a well-designed and tested supercharger kit for the car. Lincoln had set and then cancelled its own plans for a factory supercharged V-8, with Brembo brakes and 6-speeed manual option (to be shared with the Thunderbird). 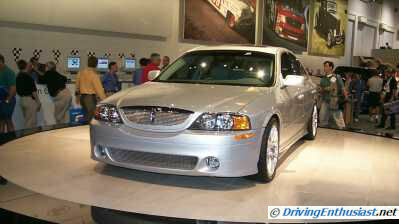 The entire idea of a new Lincoln rear wheel drive product is doubly ironic, because once the bean counters focused their beady little eyes on the LS platform they dumbed it down considerably to create the 2005 Mustang, losing the entire suspension (de-volving back to struts and a solid axle that only matched what the Camaro gave to the market all the way back in 1982!) and keeping only the middle of the floorpan and the gas tank. Even the trunk-mounted battery (part of a significant effort in the design of the LS to achieve a balanced chassis) was lost in the transition. So here we might be with a 201x Lincoln, based on the 2015 Mustang. So many years have been lost and so much progress could have been made. The new Lincoln would use the Mustang’s front strut design (slightly improved over the 2005-2014 Mustang) and the new 2015 IRS. The good news is that Lincoln could use the entire range of EcoBoost engines in it, hopefully topping out with the 3.5 liter EcoBoost V-6 – which to date the Mustang planners have refused to use (at least until Obama’s CAFE standards finally catch up with the Coyote 5-liter V-8). We can only dream about such a Lincoln, but probably for naught. Open questions are an all-wheel drive option and another variant of the chassis for a new Falcon. 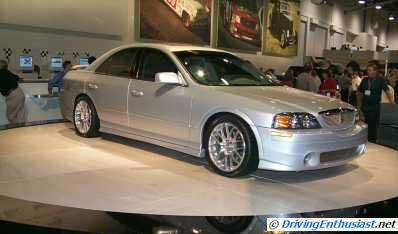 But let’s go back in time to the days of the Lincoln LS. Browse our section on the LS, and read the following review we wrote in 1999 on a performance LS concept which debuted at SEMA. Think about what could have been back then, and with continuous improvement how much could have been accomplished by now. 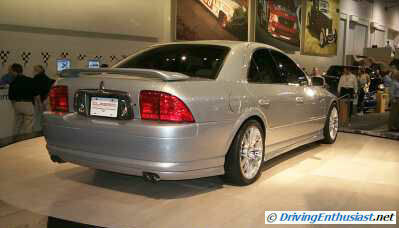 Ford brought its own concept Lincoln LS to the show, featuring several important upgrades and improvements which may point the way to future LS options. This is also Ford’s first showing of a supercharged LS V-8 engine, although Ford’s Jaguar Division already has a supercharged version of this engine in production. 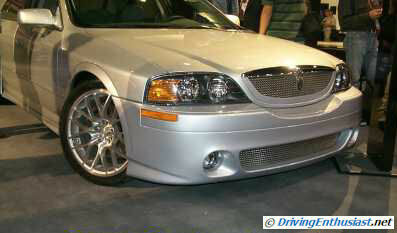 We’d almost call this the “SVT” version of the LS: it’s styling is very restrained, yet fully functional. This is again a concept car, built to gauge public reaction.